No matter what your hair type, set yourself up for success by first using a moisturizing shampoo and conditioner to smooth strands. "A big issue with air-drying is frizziness. 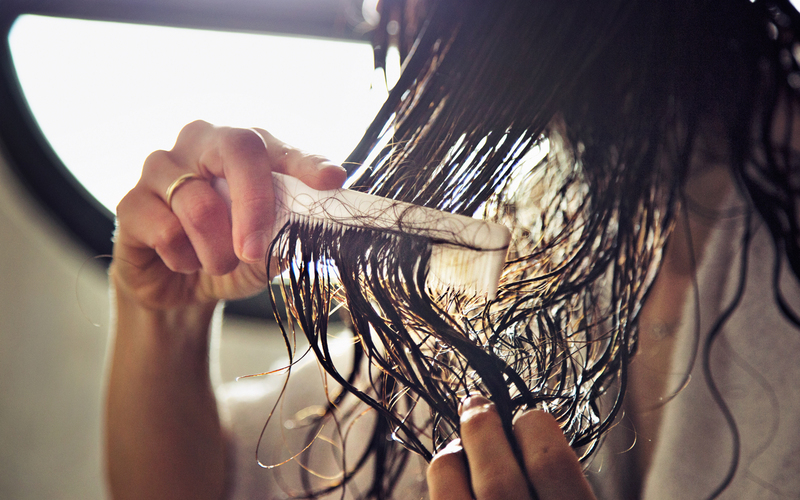 Adding in moisture helps prevent that,” says celebrity hairstylist Paul Norton. After showering, squeeze out water and use a paper towel to absorb any excess: “It doesn’t cause as much friction as a regular towel which can rough up the cuticle and make hair frizzy,” says Norton. While ringlets are still damp, coat them with a moisturizing styling balm (Norton likes Joico Moisture Recovery Treatment Balm, $19; joico.com). If you prefer more hold, mix in a dab of styling gel. "Applying products to damp curls will prevent frizz from setting in as the hair dries and results in soft smooth curls," say Norton. Try distributing a styling cream like Bumble and Bumble's new Don't Blow It (H)airstyler, which contains conditioners and polymers to give hair bounce and hold (available May 18th, $30; Bumble & Bumble Network Salons) from mid-shaft through ends. Then coil 2- to 3-in. sections of hair into mini buns (alternate the direction for more of a natural wave) and secure with a bobby pins. "The tension from the buns creates both smoothness and shape for beachy waves," says Norton. Unravel the buns when hair feels dry and rake fingers through to blend sections together. Spritz a leave-in conditioner throughout hair, working from the bottom up, and rake through with a wide toothed comb for an even application. "Even uber fine hair can get frizzy. Adding in a little moisture will create some control. Just make sure to avoid applying product to the roots; you want to retain natural volume at the crown," says Norton. We're currently into Shu Uemura's new moisturizing Wonder Worker formula ($33; available on May 1st at shuuemuraartofhair-usa.com), which contains lightweight but hydrating moringa oil. “It helps smooth the cuticle without being too heavy, and it allows hair to settle in nicely without frizz,” says L.A. hairstylist Moises Villa. Create your part and then cup and scrunch the bottoms for lift and to create slight bends. For tighter waves, go for the bun method (described above for thick hair) but make sure to create smaller 1-in. sections for more definition.